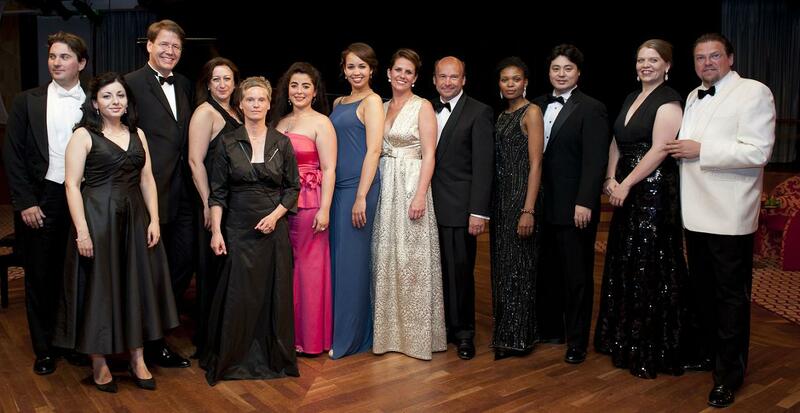 The participants in Stella Maris 2011 (left to right): Pianist Alexander Soddy, Grazia Doronzio, Sebastian Ahrens (Hapag-Lloyd Cruises), jury member Simone Young (Hamburg State Opera), jury member Marita Prohmann (Deutsche Grammophon), Gala El Hadidi, Nadine Sierra (this year’s winner), Emily Albrink, jury member Dominique Meyer (Vienna State Opera), Pumeza Matshikiza, Jaeheui Kwon, Ileana Montalbetti, jury member Michael Schade (Celebrity Tenor and Artistic Director). On the occasion of this year’s Stella Maris International Vocal Competition on board MS Europa, which took place between July 5 and 20 on an Around Britain cruise from Hamburg, seven up-and-coming talents from the field of classical music took to the stage. With their performances, they demonstrated their skills in the categories of opera, lied and oratorio. The audience prize, worth €15,000 and donated by Hapag-Lloyd Cruises, was awarded to Nadine Sierra from the San Francisco Opera. Mezzo-soprano Gala El-Hadidi from Semperoper Dresden, won no fewer than two of the coveted jury prizes – the test recording with Deutsche Grammophon, and a guest engagement at the Vienna State Opera. Another jury prize was conferred on Grazia Doronzio from The Metropolitan Opera of New York. She received a guest engagement at the Hamburg State Opera, handed over to her by jury member Simone Young, Director of the Hamburg State Opera. Besides the laureates, this year’s participants included representatives of the Canadian Opera Company, the Royal Opera House Covent Garden, the Washington National Opera and the Accademia della Scala. Under the direction of celebrity tenor Michael Schade, a jury featuring well-known personalities such as Simone Young, Dominique Meyer, Director of the Vienna State Opera, and Marita Prohmann with Deutsche Grammophon, decided on the award of jury prizes. “We have once again successfully gathered outstanding male and female singers on board and offered the jury and the audience first-class concerts“, said Sebastian Ahrens, managing Ddrector of Hapag-Lloyd Cruises. The next Stella Maris International Vocal Competition will take place between November 6-25, 2012 on a Europa cruise from Dubai to Port Louis (Mauritius). For further details please call Gay Scruton at The Cruise People Ltd in London on 020 7723 2450 or e-mail cruise@cruisepeople.co.uk.